For A Syrian Activist, Optimism Is Increasingly Hard To Find : Parallels Activist Aram al-Doumani has opposed the Syrian government since the uprising began in 2011. Despite talks aimed at a cease-fire this month, he's skeptical that there will be a breakthrough. 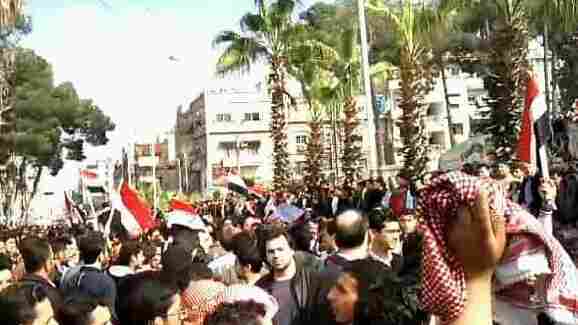 Syrian Aram al-Doumani (center, facing camera) takes part in a peaceful protest against Syrian President Bashar Assad in Douma, Syria, in 2011. Doumani, who now runs an opposition news agency in Syria, says he is skeptical of a breakthrough in cease-fire talks. Secretary of State John Kerry is trying to get all sides in Syria's civil war to work out a cease-fire by the end of December. Opponents to the Syrian regime are trying to come up with a negotiating team. There is movement, but reaching a truce is still considered a longshot in a war that's been raging for more than four years and shows no sign of cooling down. One Syrian opposition figure, Aram al-Doumani, who has good reason to be skeptical of the talks, is making the rounds in Washington this week to explain why. Doumani, 32, took part in peaceful protests against President Bashar Assad's regime back in 2011. And he was there, he said, when Syrian security forces gunned down protesters in his hometown of Douma, near the capital Damascus. "What happened there had a profound impact on us and on Syria in general. Five [people] fell in front of my eyes," including a 12-year-old, he said in an interview in Washington. Doumani runs the Syria Press Agency, a network of 120 citizen journalists. 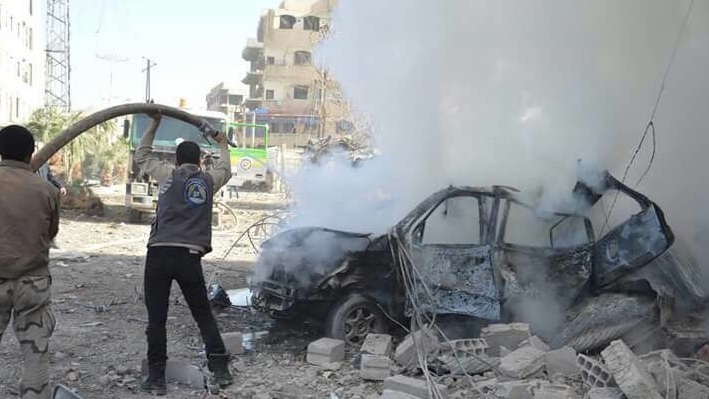 When he and his colleagues heard reports of a gas attack on the town of Ghouta, near Damascus, in 2013, they were there in minutes with no protective gear. Two men try to extinguish a fire that was ignited during heavy bombing in Eastern Ghouta, an opposition area near Damascus, in August. "Upon seeing the very large number of dead bodies, just strewn across the street, we had nausea and felt dizzy and we were in a state of shock," he said. Speaking through an interpreter, Doumani said he was initially encouraged by the Obama administration's threats to strike the Syria government forces following the chemical weapons attack. But the Obama administration eventually settled for a deal to remove Syria's declared chemical weapons. "We lost faith in Mr. Obama's Syria policy," he said. "We were really dismayed that those civilians, women and children who were being gassed, tortured and killed, just had no one to have their back." The war took another turn with the rise of the Islamic State. He said rebels forced ISIS out of his hometown of Douma, but now the area is being hit by Russian and Syrian aircraft. He doubts the ceasefire talks will stop that. "The [Assad] regime and the Russian forces and Iranian Revolutionary Guard Forces and Hezbollah forces continue to target civilians in their homes, in shops, schools, so how can we have any faith in those talks?" he said. Doumani left Syria three months ago and is threatened by just about every side in this war. His father was a political prisoner who died in detention more than a decade ago. Most of his family fled to the U.S. then. Asked how he's survived this long in Syria, Doumani takes a deep breath. "I think it was my mother's prayers. I'm her only son. I have five sisters and I'm her only son," he said. He'll join his mother and other family members in Los Angeles soon, but hopes to return to Syria one day, when it's safe. An earlier version of a caption in this story said the photo was from Douma, Syria. The photo is from another nearby town in Eastern Ghouta.